Recently, I have started to use a handy freeware known as SysSense to retrieve my earnings and other useful statistics such as CTR and eCPM from Adsense. I really like it running on my taskbar and using it to download my latest earning figures whenever I feel like it. It saves up quite an amount of time too compared to logging into the web interface to check my stats manually. 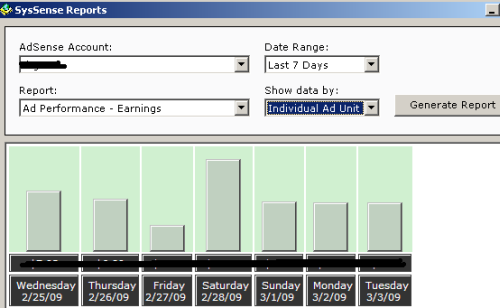 Besides, SysSense can also generate nice bar charts showing how your eCPM, CTR, earnings etc varies through different periods such as today, this month and last month for all content, search and referrals ad types. I had previously blogged about using 2 popular firefox extension to download adsense earnings but none of them can generate reports like SysSense do. Besides, being a heavy Opera user nowadays, I rarely open firefox unless I feel like doing some web development stuff (mainly due to the availability of Firebug). I still think that Firefox 3 has some issues with memory leakage problem even though the officials says that they’ve fixed it (correct me if I’m wrong). That leaves me in a position to search for an independent solution that doesn’t rely running on firefox as an extension to check for my adsense earnings. This led me to SysSense which proved to be a good candidate and which I’m still using till these days. * I’ve heard that Adobe Air can be used to develop a similar desktop application, but wasn’t able to find any yet.